As we shake out our capes, we might wish a grateful Happy Birthday to the greatest poet and playwright in the English canon, William Shakespeare; he was born (tradition holds, and reason suggests) on this date in 1564. 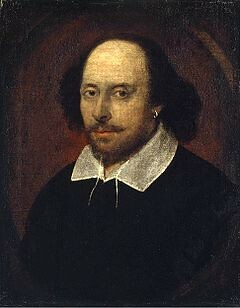 In fact, there is no way to know with certainty the Bard’s birth date. But his baptism was recorded at Stratford-on-Avon on April 26, 1564; and three days was the then-customary wait before baptism. While long-time readers know that the email version of this missive predated the blog by a couple of years, this is (Roughly) Daily’s thousandth “edition.” Many thanks to all who have generously encouraged this indulgence, to all who have enthusiastically contributed items– and to all who’ve lent their kind attention as readers.